Pictured: Kitty Genovese. Photo: The Witnesses Film, LLC. On March 13, 1964, 28-year-old Kitty Genovese was walking to her Kew Gardens apartment after finishing a late shift at the bar she managed. As she neared her building, Winston Moseley stalked and stabbed her to death. Days later, The New York Times reported that 38 eyewitnesses watched the tragedy unfold from their windows and did nothing to help her. Following The Times’ article, news outlets across the globe ran the story and social sociologists Bibb Latané and John Darley used the case as a study in urban apathy, popularizing the term “bystander effect.” As it turns out, however, little was told about what really happened that fateful night or who the real Kitty was — until now. Unearthing the facts of this 52-year-old case and the vivacious woman whose life was stolen is the focus of The Witness, a documentary directed by James Solomon (2012 Humanitas Prize winner for The Conspirator screenplay) which had its premiere last week at New York’s Independent Film Center, with more dates and locations to follow later this summer. Solomon’s directorial debut took 11 years to complete, and it was well worth the wait. His technique is respectful, engaging, and non-sensationalist — a hard thing to pull off due to the case’s sensational past. Ultimately, The Witness is a labor of love that follows one man’s search for answers that have eluded him half a century. “It’s hard to let go when you can never know the whole truth,” Bill Genovese laments from his wheelchair. The youngest of four children, Bill was 16 at the time of Kitty’s death, and by all accounts her closest sibling. After her murder, a shroud of silence fell over the family, with more tragedy to follow: his mother had a stroke the following year; his father died of a stroke at age 59. The silence became Bill’s private obsession. As his wife, Dale, explains, all Bill’s life choices have been predicated on the fact that “no one helped his sister.” Life choices that sent him to the frontlines in Vietnam, drove him to become an amateur gumshoe, and ultimately made him seek a semblance of peace through a harrowing reenactment of his sister’s murder. Unlike other crime documentaries that trace facts leading to an indictment of the perpetrator, Solomon’s film reaches an unsuspecting indictment of the newspaper whose motto is, “All the News That’s Fit to Print.” The film’s origins trace back to 2004, when the New York Times issued a moderate mea culpa for its handling of Kitty’s murder. The 40-year-old apology was prompted by a scathing report by Joseph De May, Jr., a maritime lawyer and amateur historian of his Kew Gardens community. De May pointed out grave errors made in the The Times’ lede: Kitty was stabbed at two, not three different locations, and there were never 38 eyewitnesses — facts former Queens County Assistant District Attorney Charles Skoller agreed with. Most importantly, De May argued that those who did witness something were “ear-witnesses,” not “eyewitnesses.” The gruesome idea that 38 people watched on as their neighbor was brutally murdered seemed to finally be debunked. This new information was enough for Bill and Solomon to embark on their own investigation. For nearly 11 years, we travel with Bill as he pours over court records, tracks down witnesses (a few living, many dead), and interviews some of the nation’s most esteemed news reporters, including then metropolitan editor of The Times A.M. Rosenthal and Mike Wallace of 60 Minutes. As Bill gains a better understanding of what happened to his sister in her last hour, he also gets a better idea of who she was as a person. To fill in the gaping holes about her life, he seeks out her friends, neighbors, and bar regulars. As we learn with Bill, Kitty was the “class cut-up and head of the pack” amongst her friends. She loved her job — not as a barmaid but as the manager of a popular watering hole — and her customers loved her, too. She drove a red Fiat, which thrilled Bill as a young boy, and she always nurtured her little brother’s hankering for asking questions. Periodically, and at times heart wrenching, Bill’s real-time footage is interspersed with beautifully rendered animation by Moth Collective. An invisible hand draws crisp, fine lines to reenact Kitty’s murder (and we all sighed in relief at the screening to think we’re being spared a reenactment with actors). When Bill interviews Mary Ann Zielonko, Kitty’s roommate and girlfriend who declined to be on camera, she shares, “I slept with her shirt for a long time.” An animated shirt appears on screen, floating like a dead leaf down the street where Kitty was stabbed. All of these moments lead up to what we anticipate to be the ultimate catharsis for Bill, whose family seems weary by his never-ending journey. And it’s not anything one could have anticipated. It shocks in its singularity of a moment in time so long ago. As a filmgoer, you will walk out of the theatre hoping Bill is finally able to find peace. Whether he has is anyone’s guess. Here’s to “maybe” meaning peace to the Genovese family. Video courtesy of Five More Minutes Productions. The film is currently playing at the IFC Center in NYC. For more information regarding film screenings, you can visit www.thewitness-film.com. 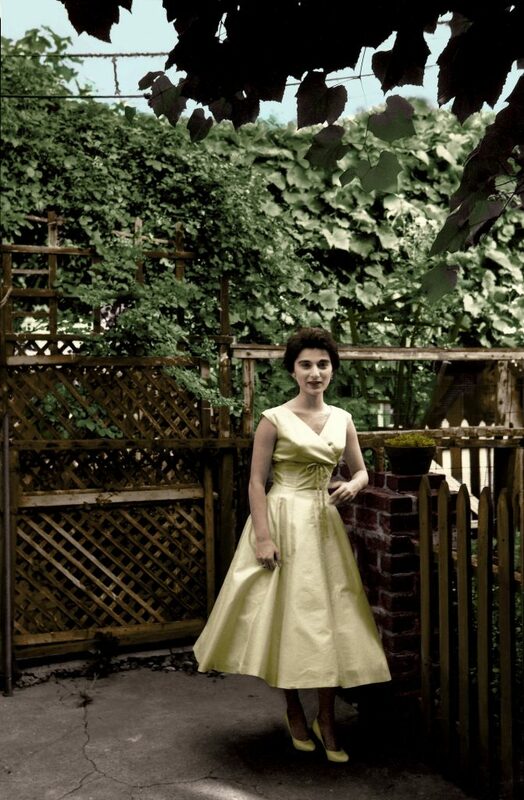 || Featured image: Kitty Genovese photographed circa 1956. Photo from June Murley. Courtesy of “The Witnesses” Film, LLC.